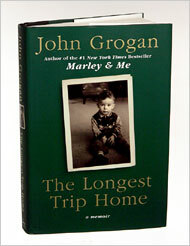 Josh Grogan connected to a million readers with his debut bestseller Marley & Me. From there, Josh Grogan connected to me too through that book. I myself was a little surprised that I loved reading Marley & Me. I am after all not a very dog-loving person. Well, not to say I dislike dogs. At best, I would say I like dogs, but I don't love them. I like playing with them. But I can't see myself owning a dog. But I loved reading that book. So when I saw this hardcover book The Longest Trip Home in Leo Bookstore selling at a bargain at only RM25.90, I grabbed it. And this book has served me well, brought me to tears or joy and laughter while reading it. Like it's first book, The Longest Trip Home is also a memoir. It talks about his childhood spanning to adulthood. But this time, the connection thread is about his family's strong Catholicism faith. Each story and chapter gives a setup, a buildup, a payoff and a punch line. Each cautionary tale describes how making a mistake taught Mr. Grogan a valuable lesson. And most of his lessons revolved around faith, loyalty, forgiveness and family values. While reading all the stories of his life, I felt very connected to him. Mr. Grogan brought me into his story and I could really feel all his triumphs and his sadness. I smiled when he achieved victories and felt his sense of loss when he ran into troubles. However, the book is still a light read which makes it a good bedtime read. While being a light read, I felt that I learn invaluable lessons from it. I love this book way more than Mitch Albom's Tuesdays With Morrie. All in all I rate this book 8/10. A definite must read. mindy...sure. i'll lend it to u when i see u next time. have to be after my HKG trip though! mid nov perhaps!